The Secret Itinerary through the Doge’s Palace contains the rooms and chambers where the delicate work of some of the most important bodies in the Venetian administration was carried out. Doge’s Palace, known in Italian as the Ducale di Venezia, was the residence of the Doge (Duke) of Venice. Its two most visible facades look towards the Venetian Lagoon and St. Mark’s Square. Additionally, the palace housed political institutions of the Republic of Venice until the Napoleonic occupation of the city. Explore the hidden corners of the palace on this secret tour of the Doge’s Palace with your private English-speaking guide from Italy’s Best. 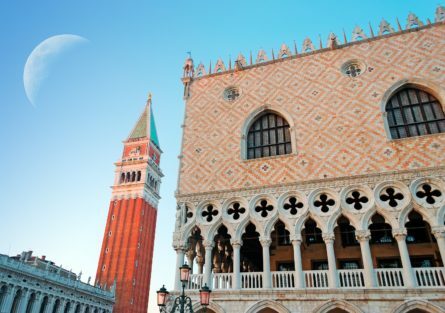 This itinerary follows in the footsteps of the most important and at times infamous–leaders of Venice. These men wouldn’t use the public doors and stairways when they walked around the palace; they would slip through hidden passageways and concealed doors, fittingly appropriate in this smoke-and-mirrors city where mask and illusion are the norm and where subterfuge was always an essential element of the politics. The guided Secret Itinerary tour lasts more than an hour and affords privileged insights into the more secret corners of the palace, rooms and passageways not normally accessible to the visiting public. Your private secret itineraries tour of the Doge’s Palace begins in the office of the Doge’s Secretary, the assistant to many of Venice’s ministers, and moves on to the rooms of The Deputy of the Secret Works of the Council of Ten, a revolving council of ten men that ruled Venice and were keepers of the secret archives. Next see the Office of the Grand Chancellor, the only Venice official elected directly by the Grand Council, who oversaw the main archives. From here, head to the Secret Chancellery, where once cupboard-covered walls were stuffed with documents charting public acts and secret deals. The mirror-clad upper doors bear the names and the coats of arms of the city’s chancellors from 1268 onward. We move through the Salon of the Regent to the Chancellery to some of Venice’s more sinister secrets, starting with the Torture Room then on to Piombi, or the leads, the palace’s original prison named for its location under its lead roof. There were half a dozen cells here separated by wood partitions: it doesn’t sound too luxurious, but Casanova for one attested that the Piombi were far preferable to the Pozzi or the wells, as the dreaded basement prison cells were called. Visit the attic at Ponte della Paglia where the walls bear coats of arms, mainly from the 1300s, then head downstairs to the Inquisitors Room. The beautiful ceiling, decorated by painter Tintoretto during 1566-67, belied its terrible function. The Sala housed the Inquisitors for the Maintenance of State Secret, a shadowy body of three men dedicated to protecting state secrets and to extract any transgressors, founded in 1539. These were secret policemen who took objectiveness, competence and efficiency as their watchwords, but their activities and their findings–uncovered by any means possible including torture were never revealed to the public. Your last stop on your private tour of Doge’s Palace is The Room of the Three Heads, reserved for a rotating monthly trio of magistrates chosen from the Council of Ten, a further example of the periodic revolving of power within the Republic as a guard against any one man assuming too much sway. Giambattista Zelotti painted the superb ceiling from 1553 to 1554, with the ante-rooms painted by Veronese and Giambattista Ponchino. Please note the itinerary can slightly change. The Doge’s Palace secret itinerary tour in Venice is extraordinary enough. The building is a quite remarkable example of Gothic civic architecture. A minimum of 2 people is required for the Secret Tour, the maximum is 25 people. The specifics of the Secret Tour may change slightly depending on circumstances.